What do cauliflower, cabbage, broccoli, Brussels sprouts, kale, and bok choy have in common? They’re all members of the cruciferous family of vegetables. Many of us are familiar with the term “cruciferous vegetables”, but did you know they’re among the healthiest things you can eat? Cruciferous vegetables belong to the mustard family of plants and are renowned for being extremely good for you. They contain so many vitamins, minerals and phytochemicals that help detoxify some cancer-causing substances, that nutritionists recommend having several servings of cruciferous vegetables every week, if not every day. Cruciferous vegetables include: arugula, bok choy, broccoli, Brussels sprouts, cabbage, cauliflower, Chinese cabbage, collard greens, daikon radish, horseradish, kale, kohlrabi, land cress, mustard greens, radish, rutabaga, shepherd’s purse, turnip, and watercress. Since I started the Healthy Lifestyle Challenge a few weeks ago, I’ve been trying to add at least one cup of cruciferous vegetables—mostly kale, broccoli, and Brussels sprouts—to my diet every day. The Kale and Brussels Sprouts Salad I posted last week has been on repeat in my kitchen all week! Recently, I came across a recipe for Cauliflower Steaks. I had never heard of cauliflower referred to as “steaks” so I was immediately intrigued. 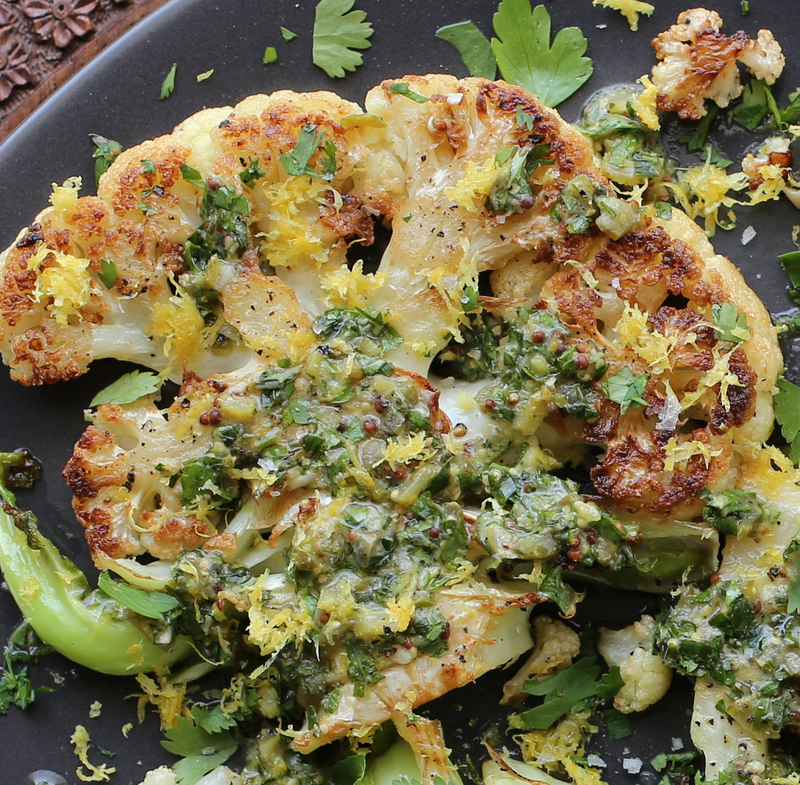 Amazingly, cauliflower is quite meaty and can be seared like a steak. 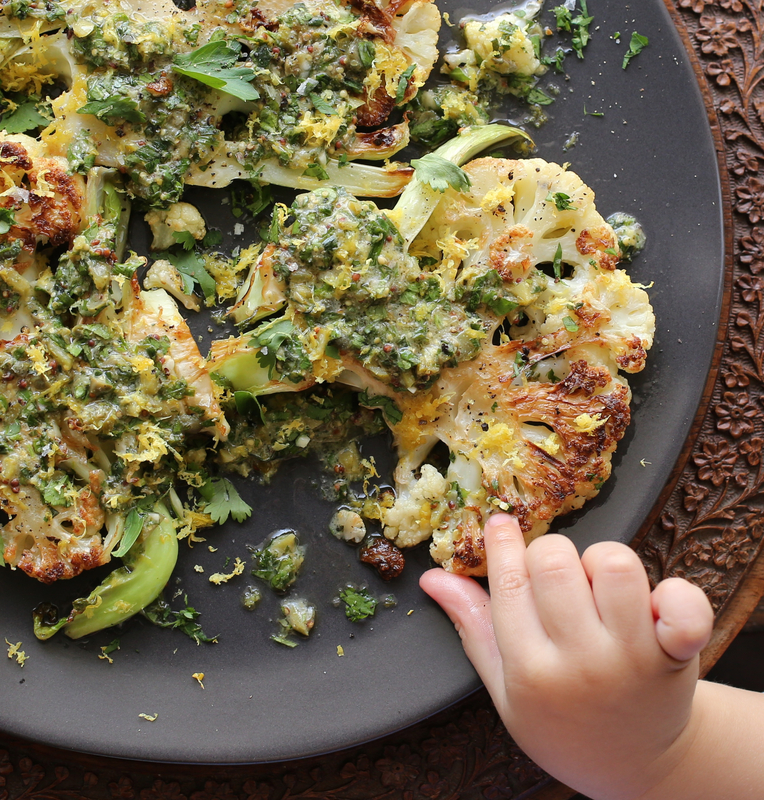 The key to a beautifully browned and crispy cauliflower steak is to get the skillet extremely hot. This recipe combines the steaks with a super-tangy salsa verde. It’s quite good, but if you have a preferred recipe for salsa verde or another salsa, it would work equally well. Next time I might try it with a chimichurri sauce. I sightly adapted the recipe for the sauce by adding harissa for a fiery kick (I left it out of my son’s portion!). Loved it, but the cauliflower steaks are also quite delicious when seasoned simply with just salt and pepper, without any sauce. Here, they’re fried, but roasting the cauliflower steaks is a healthier option I’ll try next time. A note to fellow Challengers: I mentioned you’d get bonus points this week for eating cruciferous vegetables. Now, you can get an additional 10 more points each time you share/post a photo of the cruciferous vegetables you’re eating on PWC’s Healthy Lifestyle Challenge Facebook Group page. In a large bowl, whisk the parsley with the cilantro, tarragon, capers, cornichons, garlic, mustards, olive oil and harissa paste, if using. Set aside. Cut the cauliflower from top to bottom into four or five 1/2–inch steaks (slices). Generously season them with salt and pepper. In a very large skillet, heat the canola oil until very hot. Add the cauliflower in a single layer and cook over high heat until browned, 2 to 3 minutes. Carefully turn the steaks, add the wine and cook until it is evaporated and the cauliflower is tender enough to be easily pierced with a knife, about 3-5 minutes. 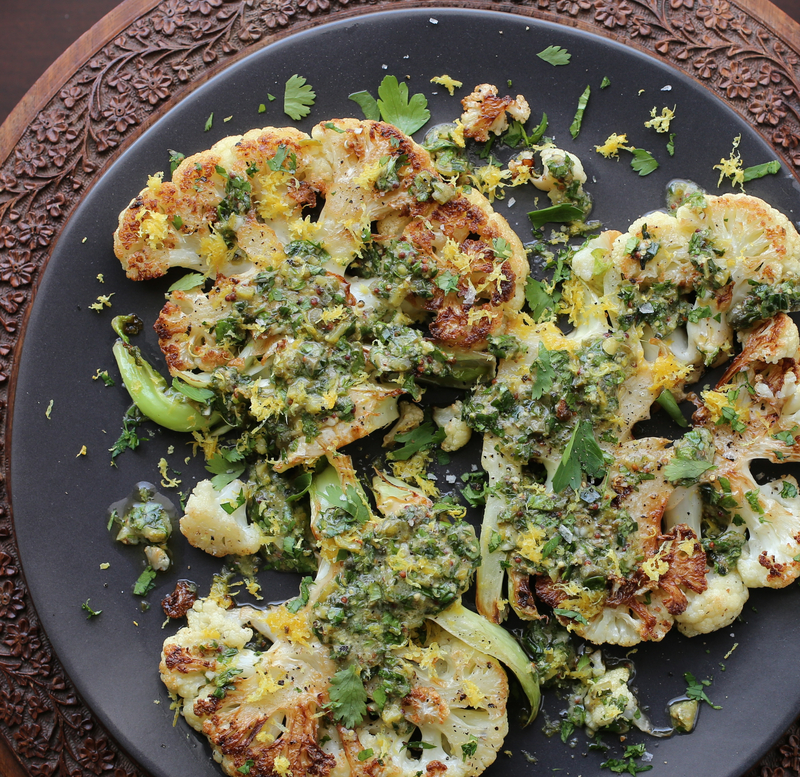 Transfer the cauliflower to a platter and sprinkle with lemon zest. Stir the lemon juice and vinegar into the salsa verde and season with salt and pepper. Spoon the sauce on the cauliflower and serve. I love cauliflower steaks. O’s little hand is precious. Clean, classic and bright flavor profile! Love the herbs, wine, lemon. Thank you Shanna! 🙏 I don’t know why it took me so long to make them, so yummy. Can’t wait to add the dimension of color when making them with purple and orange cauliflower! Or green…. 🙂 You could do a trio. Maybe a bit of roasted red pepper to make the color palette complete. Bravo! This is such a fantastic recipe! I am going to make this for sure. I have been away from your blog for some time I see I have some catching up to do. Love your new theme and I must read up on your healthy lifestyle challenge. Always love your posts and recipes! Thank you Seana! So glad you like the new theme. I’m still learning how to navigate it. And so happy you’re enjoying the posts and recipes!! We’re about to enter our final week of the healthy lifestyle challenge. I’m already looking forward to the next one! Oh my gosh I thought I was the only one with tiny baby hands in my food photos! Love it, these look fabulous! Thanks! I love the little hands too! Always make photos so much more sweet!